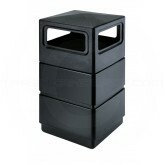 The durable 38-Gallon Three-Tier Waste Receptcles are built to be sturdy and withstand the harshest environments. 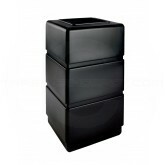 These units are perfect for high traffic areas. 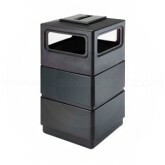 Lift-off lid for easy trash removal includes patented Grab Bag™ system secures trash bag in place. Molded from long-lasting polyethylene; won't rust, dent or chip. Dome Lid Model with ashtray features two built-in security clips that secure ashtray in place and makes ashtray removable for cleaning. Plastic is approximately 1/8" thick. 50% post consumer recycled content.